Helen Goodall of Oakland, California, USA—for the Western States. ‘Abdu’l-Bahá had four of the tablets (to Harris, Baghdadi, Goodall, and Maxwell) addressed in care of Joseph Hannen in Washington, D.C. The fifth tablet (for the Southern States) was addressed directly to Hannen. The tablets arrived in the United States during the summer of 1916 and were published in the September 8, 1916, issue of Star of the West. They immediately generated an inspired response as Bahá’ís, in obedience to ‘Abdu’l-Bahá, began to plan traveling teaching trips to take the Faith to places where there were no Bahá’ís. In the October 16, 1916, issue of Star of the West, the editors even proposed that those five people serve as temporary teaching coordinators for their regions. Subsequently, the Bahai Temple Unity Board—the continent-wide coordinating body to build the Bahá’í House of Worship in Wilmette, Illinois—appointed a teaching committee for each of the five areas, the first area-wide Bahá’í teaching committees in North America. The Tablets of the Divine Plan thus marked the beginning of systematic efforts to spread the Bahá’í message throughout the United States and Canada. In its continued commemoration of the centenary of the revelation of ‘Abdu’l-Bahá Tablets of the Divine Plan, the Wilmette Institute presents below short biographies of the five recipients. 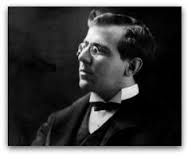 NORTHEASTERN STATES—Hooper Harris: William Hooper Harris was a lawyer who lived all his life in New York City and vicinity. He became a Bahá’í in 1898 when the Faith was first taught in New York and was a member of the Bahai Board of Counsel when it was first elected in 1900. He was the Vice President of the Persian American Education Society, an organization American Bahá’ís established to support Bahá’í schools in Iran. ‘Abdu’l-Bahá stayed in His home in during His trip to the United States and Canada in 1912. SOUTHERN STATES—Joseph Hannen: Joseph Hannen was born in 1872 in Allegheny, Pennsylvania, and became a Bahá’í in Washington, D.C., around 1903, along with his wife, Pauline, her two sisters, and his mother-in-law. 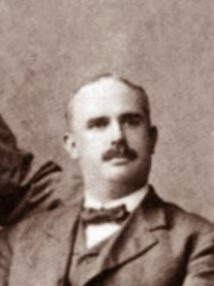 A manager of a pharmaceutical company, Hannen was an early member of the Washington Bahá’í “Working Committee” and later was a member of the Bahai Temple Unity Executive Board. He and Pauline, with Lua Getsinger, pioneered the effort to teach the Faith to African Americans. Louis G. Gregory, an African American attorney whom Shoghi Effendi later appointed a Hand of the Cause of God, became a Bahá’í in their home. Hannen was the Bahá’í to whom ‘Abdu’l-Bahá sent four of the tablets to four other Bahá’ís in his care and the fifth one directly to him. When Hannen died in January 1920, Shoghi Effendi designated him a Disciple of ‘Abdu’l-Bahá’í. CENTRAL STATES—Dr. Zia Baghdadi: Zia (light) Mabsut (happy) Baghdadi was born in Beirut, Lebanon, in 1884, the son of Muhammad-Mustafá Baghdádí, an apostle of Bahá’u’lláh, and the grandson of Shaykh Muhammad Shibl, a Shaykhí clergyman who became a Bábí in 1844 and was a follower of Táhirih. Bahá’u’lláh gave Zia his first and middle names. He attended the American University of Beirut and graduated as a physician. In September 1909, on ‘Abdu’l-Bahá’s advice, he moved to Chicago to further his medical studies and soon emerged as a pillar of the Chicago Bahá’í community. 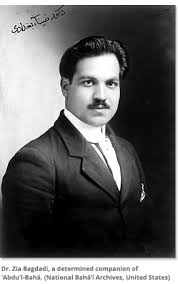 A major translator of ‘Abdu’l-Bahá’s tablets into English and the editor of the Persian pages of Star of the West, he accompanied ‘Abdu’l-Bahá on much of His North American travels in 1912. Zia was elected to the Chicago House of Spirituality (forerunner of that city’s Spiritual Assembly) and also to the Executive Board of the Bahai Temple Unity. During the “Red Summer” race riots of 1919, he traveled frequently into black Chicago neighborhoods to provide food and medicine. He retired to Augusta, Georgia, to serve the Faith in the American South and died there in 1937. Shoghi Effendi requested that the Chicago community and surrounding communities hold a memorial service for Dr. Baghdadi. 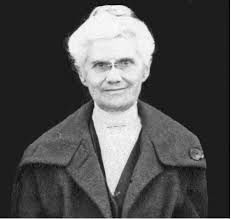 WESTERN STATES—Helen Goodall: Helen Mirrell Sturtevant Goodall was born in March 1847 and married a wealthy San Francisco businessman. 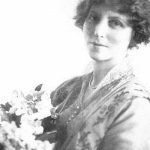 In 1898 she heard about the Bahá’í Faith from a friend who had heard about it from Lua Getsinger, who was speaking about the Faith at Phoebe Hearst’s house in Pleasanton, California. Since Getsinger and Hearst had already left for the Holy Land to visit ‘Abdu’l-Bahá, Helen Goodall and her daughter, Ella Goodall Cooper, took the train to New York to study the Faith. They became Bahá’ís there in 1898. Back in the San Francisco area, Helen and Ella became two of the most prominent believers in California. Their home became the center of public meetings on the Faith as well as community gatherings. The Cooper house in Oakland hosted many large gatherings when ‘Abdu’l-Bahá visited the area. Goodall loved ‘Abdu’l-Bahá so intensely that when she heard of His passing in November 1921, her health declined, and she died in February 1922. 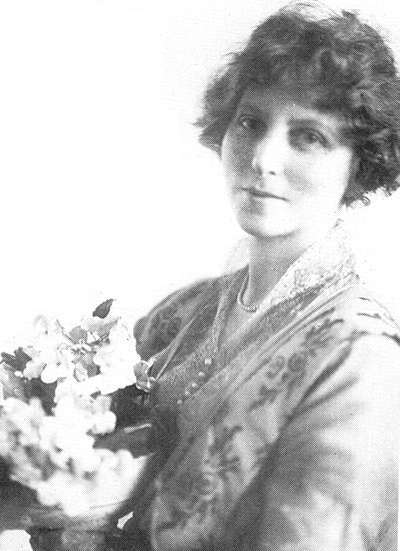 Shoghi Effendi designated her a Disciple of ‘Abdu’l-Bahá.